Good day, forex friends! I had a relatively light shift at the coffee shop today so I was feeling energized and ready to work on my trading skills. As I was doing my research, I got so intrigued with Pip Surfer’s blog because it made me realize that it was possible to trade, and even profit from, a purely mechanical system. I’ve read that the biggest issue that prevents traders from winning is the psychological burden of entering a trade, holding on to a trade, and eventually exiting a trade. By having a mechanical system with a strict set of rules, this psychological burden is lifted from the trader and makes jumping in and out of a trade easier. I keep hearing that “the trend is your friend” so I decided to come up with a system that would allow me jump in a trade based on the general direction of the price movement. I’ll be combining a trend-following indicator (moving averages) with an oscillator (stochastic) for confirmation. On top of that, I’ll be adding filters in order to avoid fakeouts. I will be forward testing this system as well as adjust it as time goes by. I don’t really know if it will work… But I guess we’ll just have to see together, eh? In any case, I will be recording all the trades that I take using this system so that I can keep track of the number of wins/losses, longest winning streak, largest pip gain, and maximum drawdown, etc. This way, I’ll be able to gauge the system’s profitability and make adjustments if necessary. So, here it goes (drum roll, please)… THE HLHB Trading System! Anyway, the idea is to open two long positions whenever the following conditions are fulfilled: the fast 10 EMA (blue) crosses over the 20 EMA (red) from under and stochastic is in between 50 and 80. In order to avoid whipsaws and get additional confirmation, I’ll set my orders 30 pips above the previous crossover candle’s high (roughly 25% the pair’s Average Daily Range). Going short is just the doing everything the opposite way. 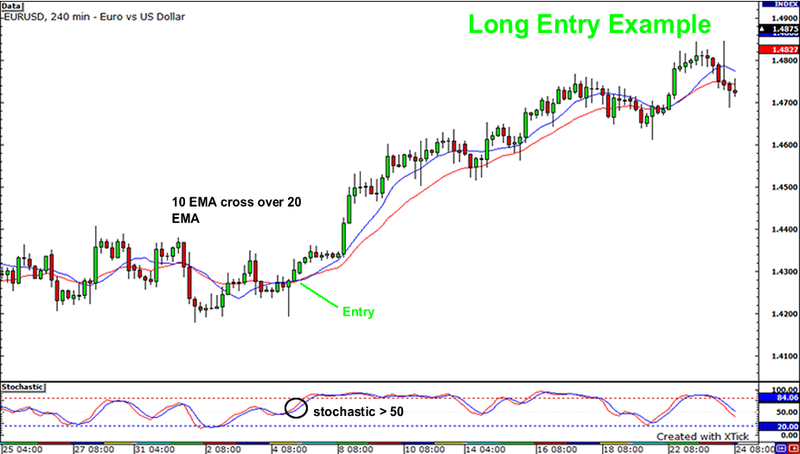 This means I will open two short positions 30 pips below the previous crossover candle’s low whenever the 10 EMA (blue) crosses over the 20 EMA (red) from above and stochastic is between 20 and 50. Profit targets are simple. I set my first profit target equal to the Average Daily Range of the pair, which is roughly around 150 pips for the EURUSD pair. Once that is hit, I will put a 150 pip trailing stop on my second position to ride the wave and create a risk-free trade. Of course, I know that I won’t be hitting my target all the time as trends sometimes reverse. Because of this, I will also exit my trade manually when another cross over occurs. 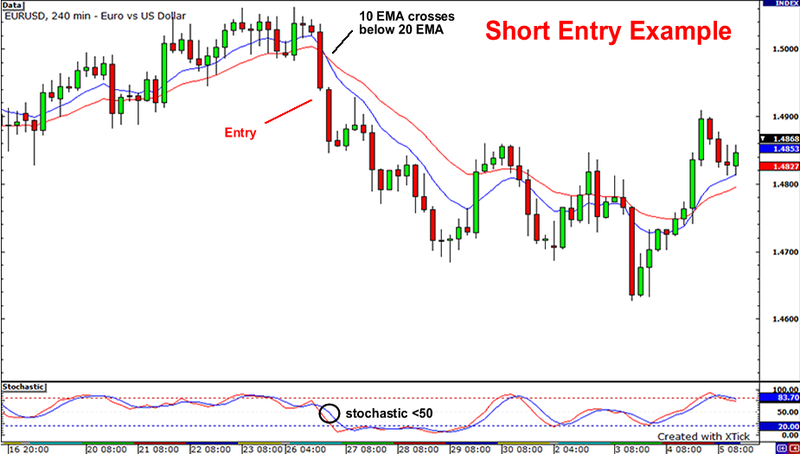 My stop loss points would be set 10 pips above / below the low / high of the candle BEFORE the crossover candle. If that happens, I believe my trade idea is invalidated. My stop cannot exceed 150 pips. 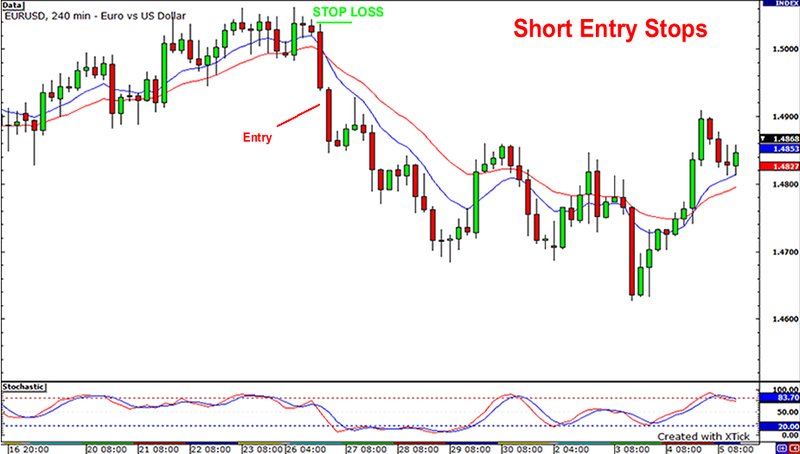 Below are examples of where I would put my stop loss orders. There are times that I will stay on the sidelines on major economic reports releases. These include interest rate decisions, GDP release, employment reports, and retail sales data. This will enable me to avoid unusual amounts of volatility which could wipe out my trade. If I have an open trade and a major economic report is coming up, I will close it before the report is released. This list is not set in stone as market conditions are always changing. A market moving report today might not be anymore tomorrow. I will be using BabyPips.com’s Forex Calendar for this. I will never risk more than 1% of my trading account on a single trade. I will adjust my position size depending on my stop loss. That’s it, my forex-mates! I hope this HLHB mechanical trading system of mine helps me catch those pips! Oh, and if you’re wondering what HLHB stands for… Huck Loves Her Bucks!